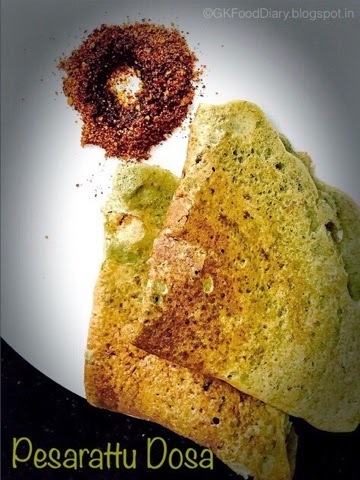 Whole moong dal dosa, Green Gram dosa or pesarattu is a Andhra special dosa variety made with green moong dal. It was introduced to me after coming to Chennai. 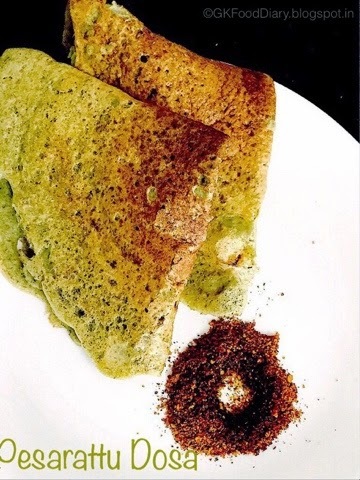 The moment I have tasted this Dosa in a restaurant, I loved it to the core for its unique taste, green color and health factor as well. We include green moong dal in our weekly menu in the form of Pesarattu dosa, Sundal or sprouts as it has high proteins. 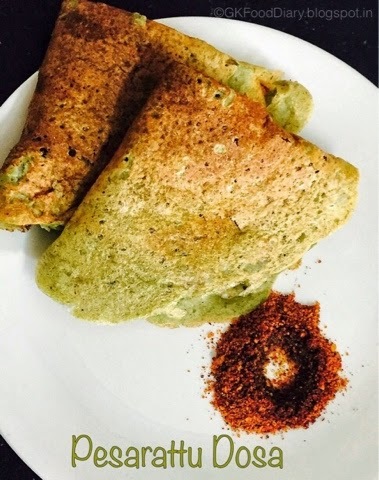 This healthy dosa is very simple to make with few ingredients and apt for breakfast. Serve the dosa with rava Upma, coconut chutney, Idli Milagai podi or even curd. It tastes good with out any side dish too. This can be given to babies from 10 months. Now let’s get on to check whole moong dal dosa recipe for babies, toddlers and kids. 1. 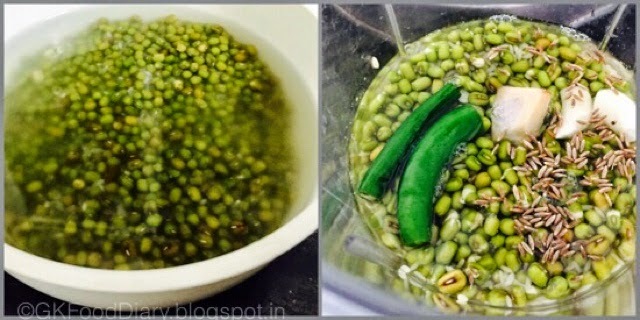 Soak green moong dal and raw rice for 8 hours or overnight. The water fully absorbed by the green moong in the morning and it will be double in volume. In a blender, take soaked green moong dal with rice,ginger, green chillies,garlic cloves and cumin seeds. Add little water and grind it to a coarse paste. 2. Chop the onions fine and keep aside.Transfer the ground batter to the vessel and add onions,Coriander leaves along with salt. Mix well and set aside. 1. Heat a dosa tawa, add a laddle of batter to it and spread thin or thick as per your preference. Cook until brown for three minutes and flip the dosa. Cook for another two mintute and remove from tawa. Repeat the same process for the remaining batter. The healthy and tasty breakfast is ready ! Serve with sidedish of your choice. 1. This is my way of making Pesarattu dosa and it is not a traditional method of making Pesarattu. 2. 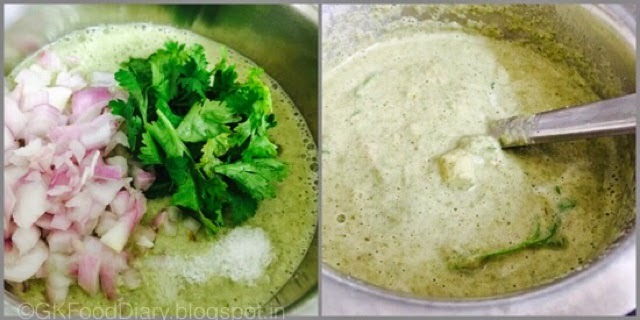 Onions can be added while cooking the dosa instead of mixing with the batter. 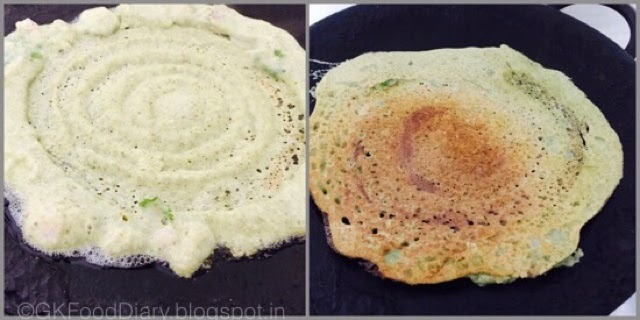 3.You can either make the dosa thin or thick like adai. That’s purely your choice.For a thin dosa, add little more water to the batter before making dosa’s. 4. Always check with your pediatrician before introducing any new food to your baby. 5. Adjust spices according to your baby’s tolerance level. I have tried this for my 11 months boy. He wont eat. It’s big tough for me to feeed. But he likes a lot this dosa. Thanks for this recipe. Hi, How many days can we store the batter for this dosa? It Stays good for two days in the refrigerator.